Americana music isn’t exactly known for its thunderous drums or equilibrist drummers. However, less playing doesn’t require the lesser player. On the contrary: holding back and playing subtile but focused is an art in itself. That’s why we called in one of the hardest working drummers in the business: Thomas Hedlund. Member of French Grammy Award-winning pop-wonder Phoenix, Sweden’s The Perishers, Deportees, Khoma and Cult of Luna, this chameleon of a drummer knows like none other how to adapt and conform to any given context. 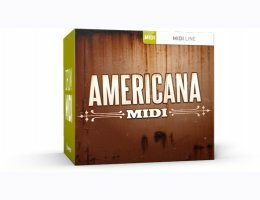 Americana MIDI is a collection of basic grooves and fills for anyone looking for versatile no frills drum MIDI that still has heart, soul and that inimitable human touch. Works with EZdrummer, EZdrummer 2 and Superior Drummer 2 (optimized for 1 kick, 1 snare, 2 toms, 1 floor tom, 2 crash cymbals, 1 ride cymbal). 2 GB free hard disc space, DVD drive. A working version of EZdrummer, EZdrummer 2, Superior Drummer 2. Mac OS 10.6 or higher, Intel-based Mac with 2 GB RAM.